An exploration of numbers behind the news. Focus on Federal fiscal policy, war spending, and common myths about growth. A progressive take on issues, with an adherence to the way the economy actually works. If you want wishful thinking, you won't find it here. 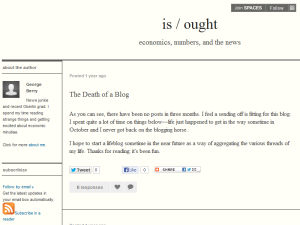 This what your Is / Ought Blog Ad will look like to visitors! Of course you will want to use keywords and ad targeting to get the most out of your ad campaign! So purchase an ad space today before there all gone! If you are the owner of Is / Ought, or someone who enjoys this blog why not upgrade it to a Featured Listing or Permanent Listing?